Working the most popular V5 in town. The Polish Traverse. Start: At the extreme low point of the crack mentioned in Low Traverse. 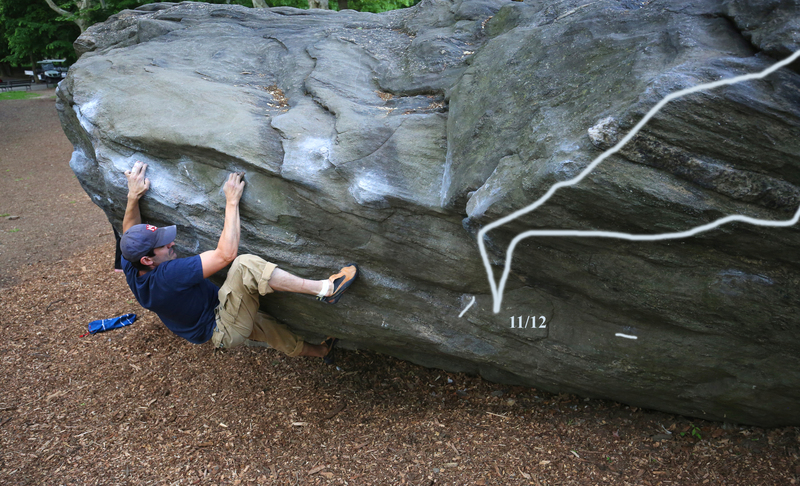 Go: Layback the crack to the top of the boulder. Go: Instead of laybacking the crack, move up a little and then reach out right for a hold at the bottom of the starter flake. Move feet right and bring the left hand over to a side pull on the starter flake. Power to the top. Since the original hold at the bottom of the starter flake broke, this problem is significantly harder. Start: Sitting beneath the large overhang on the right side of the north face. Hands matched on undercling. Go: Out, up and over. Currently has seen only a small number of complete ascents. Start may be body-size specific. All the climbers who have completed the start were fairly short in height. 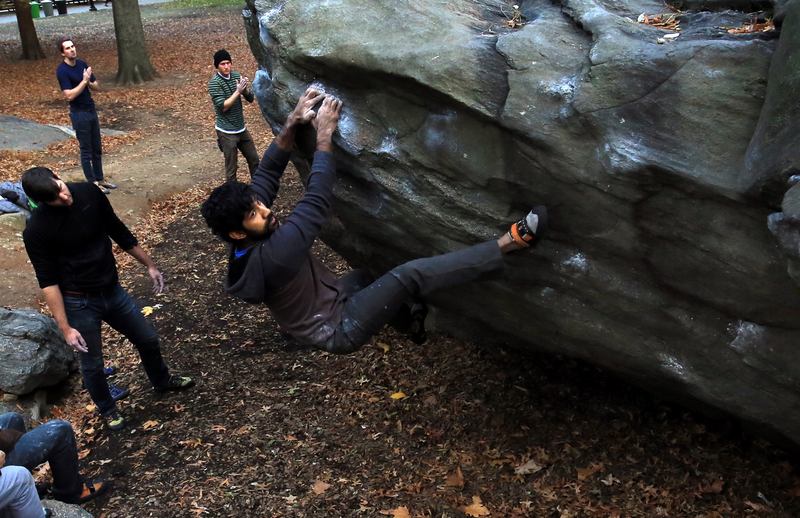 If you start with the right hand out on the first sloper the grade drops to V8. Start: At the bottom of the right-leaning crack, just left and below the "starter" flake. 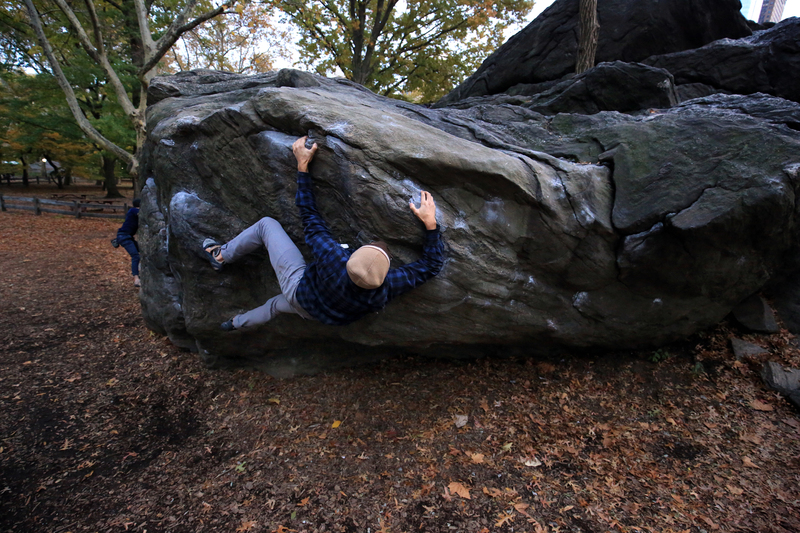 Go: Move up and traverse right past the "starter" flake following hand holds just below or at the lip. 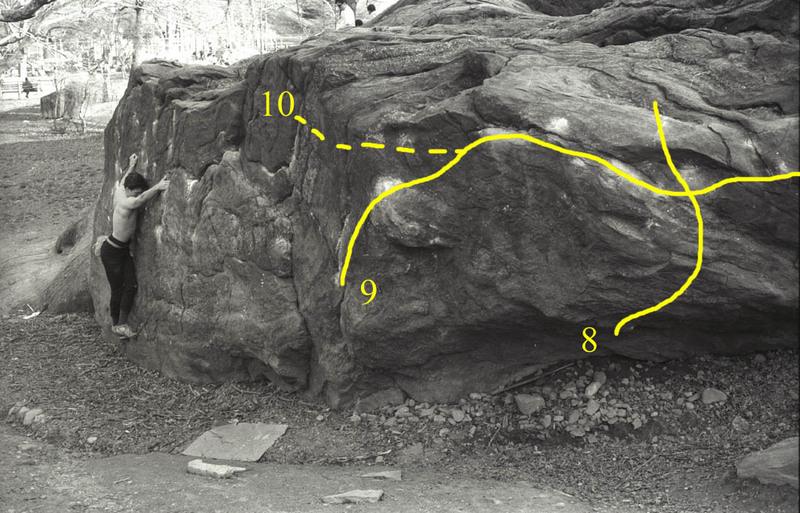 Traverse right onto the small holds of the small west face and continue to a crack. Finish by moving right along the lip of the rock and step off. 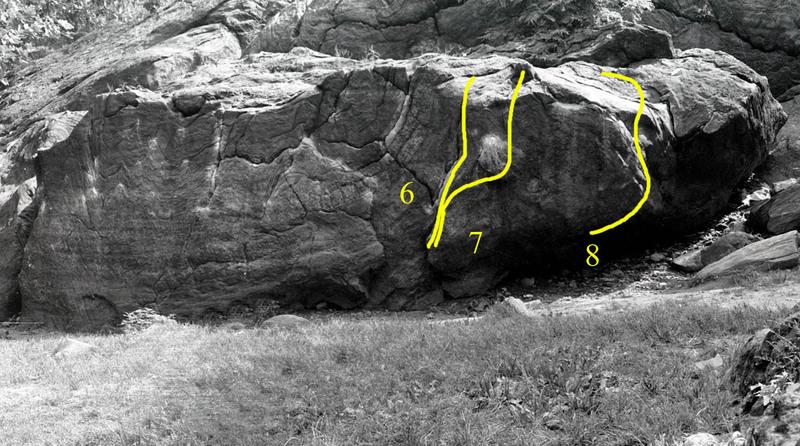 This was a long-established problem with several variations before it became known as the Polish Traverse. It acquired that name in the early 90s after a number of strong climbers from Poland began working the problem extensively. Start: As one ends the left-to-right version of Rat Rock Traverse or the High Traverse. Go: Stay high as you move right toward the right-leaning crack. 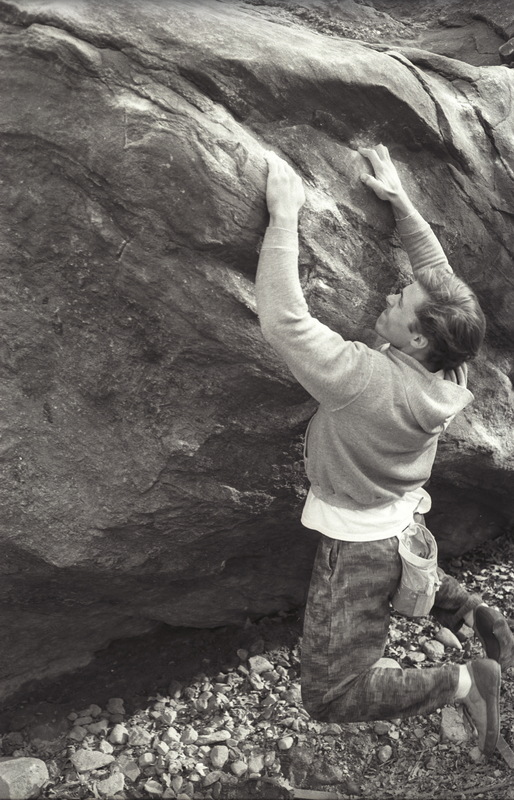 Use holds above the "starter" flake and below the lip to link up with the Overhanging Traverse. An excellent link-up problem that is fun to do by itself. Removal of big rocks made these problems accessible. Start: Beneath last dark overhang that marks the end of the Polish Traverse. Left hand on side-pull, right hand on low, tiny crimp. Go: Up and right. A powerful move with the left hand to the small prominent flake beneath the obvious large one. Continue moving up and right using the larger holds along the lip of the overhang. Start: Same start as for Smack the Dragon. Go: Make the same opening move with the left hand as Smack the Dragon. Then move right, staying low on tiny crimpers and then moving up on more tiny crimpers until you are forced to top out at the far end of the overhang. Campus-styling the No Feet var of the Polish Traverse. Compare with the modern beta in photo above.